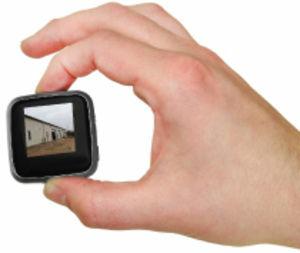 The DVRG200 is the World's Smallest High Definition Spy DVR with a color TFT Screen. Measuring just under 2" x 2" and a little over half an inch thick, this device can easily be concealed inside almost anything or hidden anywhere, and record audio and video. 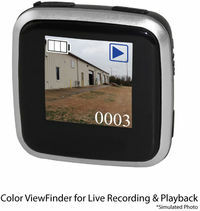 With the TFT screen you can watch live as the DVR is recording or playback immediately after recording something. It also has a motion detection feature, so it can be set to record only when someone comes into view, and can take still photographs as well. It records at 30 frames per second with a resolution of 1280 x 960 in High Definition. 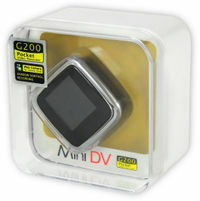 It can also function as a web camera for online video chat and can record audio only. The DVRG200 comes with an USB cable and driver disc for simple and quick playback on your PC or Mac, along with a detailed instruction manual, driver installation cd, wall mount (w/ screws for the wall mount), Velcro strips, a velvet carrying pouch and lanyard.